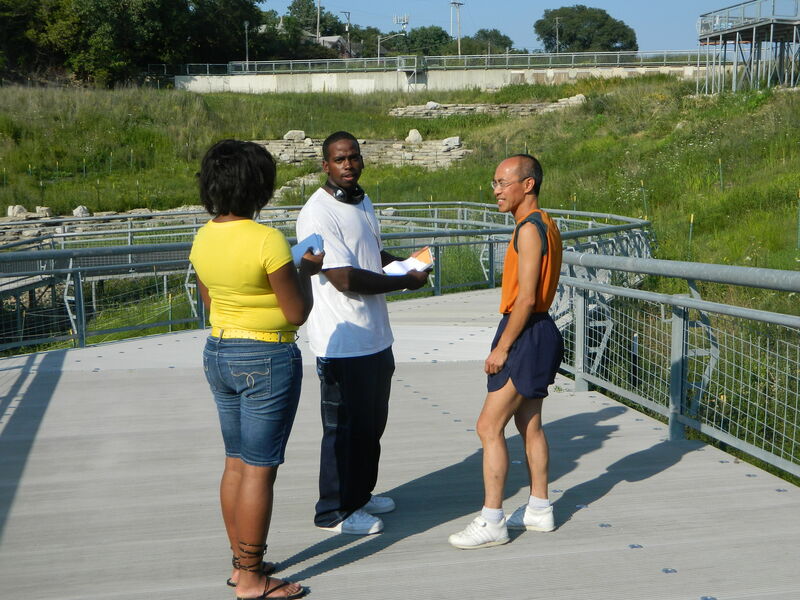 Eco Youth Reporters Jasmine Hunt and David Cal interview a passerby at Harry Palmisano Park. Photo by Kari Lydersen. The Bridgeport and Pilsen neighborhoods on Chicago’s Near South Side are heavily industrial, with factories, highways, railroad tracks and warehouses. The area used to be famous for the stockyards and slaughterhouses depicted in Upton Sinclair’s The Jungle. Bubbly Creek, which runs through the area, got its name from the decomposing bodies of animals from the slaughterhouses. But in the middle of all this industry there are pockets of nature where people enjoy the outdoors. On Halsted Street in the Bridgeport neighborhood – home of Mayors Richard M. and his father Richard J. Daley – Henry C. Palmisano Nature Park is an oasis created on a former limestone quarry and landfill. To the north you can see the smokestack of the Fisk coal-burning power plant, which closed down this year. When you enter the park from Halsted, you see limestone boulders where fossils are located. There are also native plants with deep roots that hold large amounts of water in the soil. During rain storms the native plants hold the water and prevent it from flooding or contaminating other areas. A drain pipe sends storm water into a wetland in the park, where the plants clean the water as it filters through. Metal stairs align parts of the park near a pond created by part of the quarry with steep walls. Rabbits and monarchs inhabit the park. Attention-grabbing graffiti on a park wall proclaims “I Love you! Don’t you ever question that” with a big painted heart.Jose Perez visits the park every week and his son likes to swim in the pond. On a hot summer afternoon, Perez was jogging with his shirt off. About a mile west of Palmisano Park is Canal Origin Park, just off Ashland Avenue around 27th Street, at the confluence of the Chicago River and the historic I&M Canal and the Chicago Sanitary and Ship Canal. This is also a place where people fish and enjoy nature in the middle of the city. For a century these Chicago waterways moved goods in and out of the city. The waterway also transmits Chicago’s treated sewage down to the Mississippi River and allows invasive Asian carp to travel toward Lake Michigan. On the west side of Ashland there’s concrete path along the Sanitary and Ship Canal, where people ride their bikes, exercise and fish. It is decorated with weeping willows with long branches and leaves almost touching the ground – representing tears. A dead fish floated on the water below the trail. Across the canal from the trail is an old abandoned grain elevator covered with graffiti, which people sometimes occupy. It makes you think about the employees who used to work in these dangerous conditions. On the east side of Ashland, plaques describe the history of the canal. Nearby, Sheryl King, 58 and retired, was fishing on the canal with her son. Under the water you could see green scum and strands of algae. King has been visiting the park for several years. She said the best fishing time is around 8am to 9am and no later than 11am; or 4pm in the afternoon. She only fishes in certain parts of the river and Canal Origin Park is her usual spot. She fishes for blue gills and other fish. When asked about the fish quality, she said “certain catfish are questionable.” She sometimes sees snakes there also. The Chicago River and parks like Palmisano offer many historic and enjoyable activities for Chicagoans. But to enjoy these places, the river and the air must be clean and protected. Both parks we visited are examples of how these few natural areas in the middle of the city can be preserved and enjoyed. 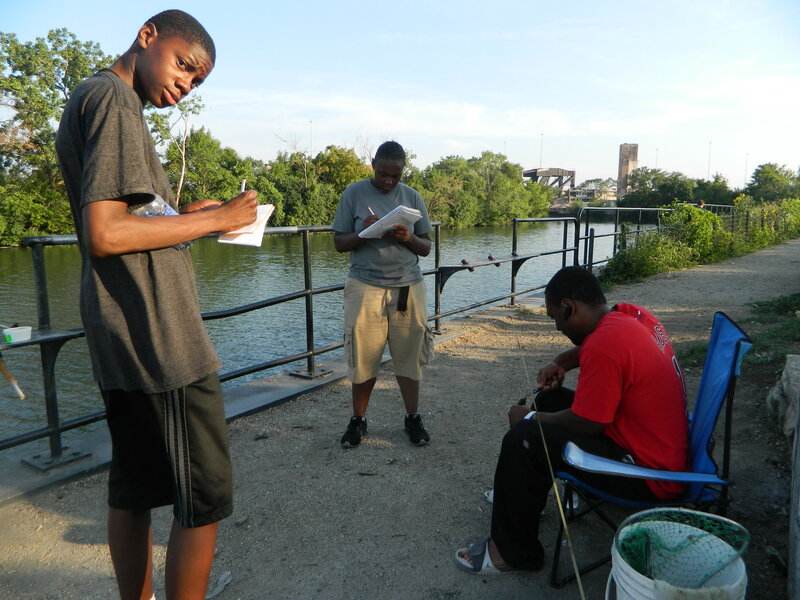 Eco Youth Reporters Jaylen Miller and Tyreshia Black interview fishermen on the Chicago River. Photo by Kari Lydersen. This entry was posted	on Friday, December 14th, 2012 at 10:11 pm. You can follow any responses to this entry through the RSS 2.0 feed. You can leave a response, or trackback from your own site.